Paddle boarding is a wonderful activity for all ages and ability levels. Some people paddle for a heart-racing workout and others use it for a relaxing day on the water. Either way, it is an activity that encourages physical fitness and adventure! DREAM has both standard paddle boards as well as adaptive Onit Ability boards that include a customized locking chair and outriggers to provide stability. 2019 Schedule & Registration details coming soon! Cost: $5/day or $25 for Six-Week Program, including a day on Lake McDonald in Glacier; Veterans & Service Members with a disability – free. Financial Aid Scholarships available. Contact programs@dreamadaptive.org for more info. Time: 10AM-Noon *A parent or guardian must be present at all times for participants under the age of 18. Individuals, families, or groups – contact us to schedule an outing! 1. Please complete the Online Registration Form *Registration Closed for 2018. 3. An original signed insurance waiver is required to participate. Please bring it with you the day of the event. For participants under 18 a parent/guardian signature is required. **Don’t forget to bring all your personal belongings such as swim suit, towel, sunscreen, etc. DREAM will provide several different types of paddle boards and kayaks, as well as life jackets. 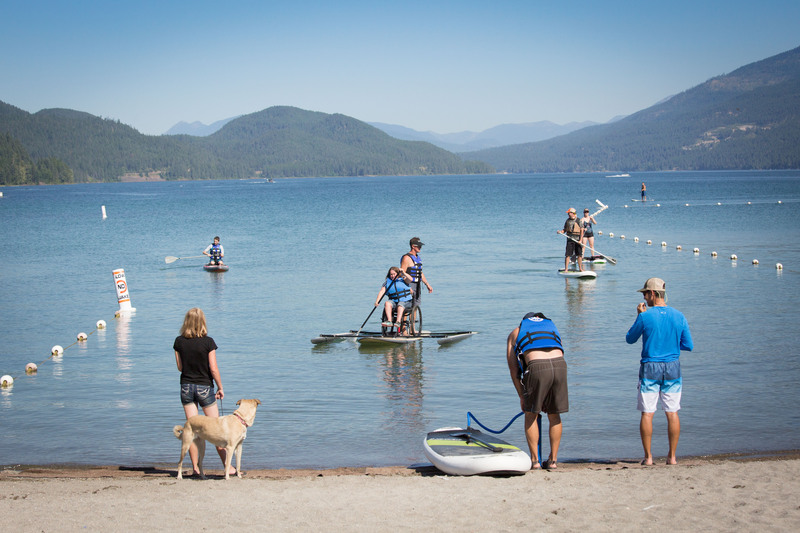 Paddlefest, Wayfarers State Park: Saturday, May 19 10A-5P & Sunday, May 20 10A-2P – event is free; park entry fees apply. Come check out the latest gear from local vendors and participate in different clinics. Dream will have a booth and our adaptive paddle boards available to try! Bigfork Whitewater Festival, Paddleboard Flat Water Race Saturday, May 26th 10:30AM in Bigfork Bay – 1.25 miles. Contact programs@dreamadaptive.org for more info! Windermere SUP Cup, Paddle Board Race, July 22nd – 4.2 mile course on the Clark Fork River in Missoula. Pre-race paddle day on Frenchtown Pond, Saturday, July 21st. Contact programs@dreamadaptive.org for more info!